Euro Corner Closed? August First Open? I have sad news sopressata fans, it looks like Euro Corner is closed. It looks like you can purchase sopressata at the associated Euro Market. I moped my way next door to August First a new bakery / cafe / deli. In the above picture it’s on the left. The baguette was great, crispy and chewy, without feeling like a jaw muscle workout. The chicken salad was good, August first appears to use the whole chicken instead of just the breast so the texture is a bit different that you might be accustomed to. The slightly tart cranberries are a nice counterpoint to the curry. The balsamic vinegar salad dressing was awesome, nice emulsion, and very fresh tasting. ~$9.00 with tax. It’s definitely worth checking out, and they’re in a nice space. August first appears to be hitting the social media with updates, kudos for that effort. Hopefully they’ll add sopressata to the menu. New world Tortilla now makes their own wraps, I’ve seen them make the wraps with my OWN EYES in the front window of the Burlington shop. It’s a nice distraction while you wrap is prepared. Fresh spinach can now be found in the spinach wrap. Not too much more spinach flavor, but the wrap is significantly more crispy and less gummy /soggy at the end of a Thai chicken wrap. More fresh spinach please! The Cayenne pepper wrap is a home run with the chicken salad wrap, it has the perfect amount of heat to “kick it up a notch”. Prices have gone up slightly at NWT, likely due to the new in-house wraps; It’s still worth it. 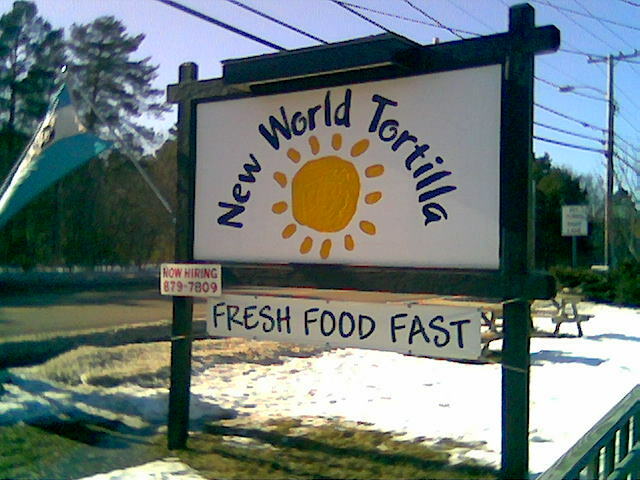 New World Tortilla is one of my favorite lunch spots, they now have 3 locations. 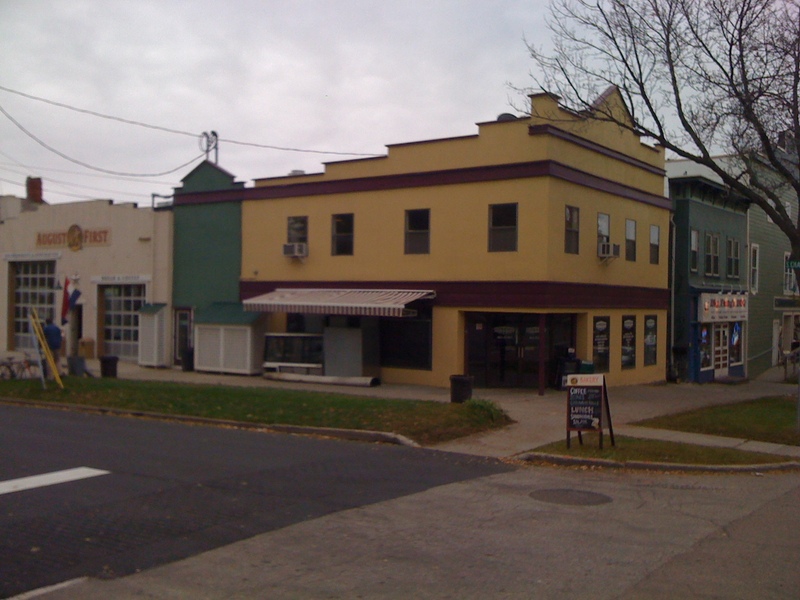 Original Burlington Vermont location, UVM, and now Essex Vermont. 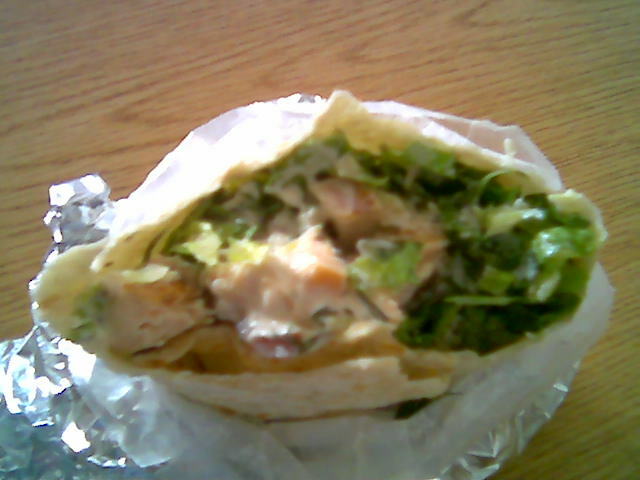 As the name implies “New World” has great wraps. 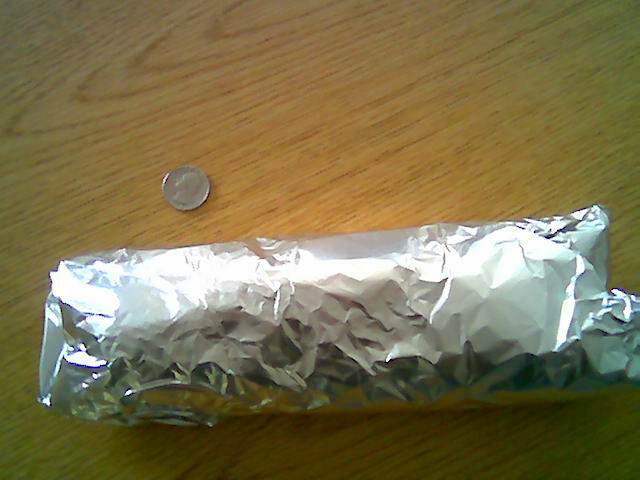 Pictured here is the Wrap, notice the large size, quarter for reference. 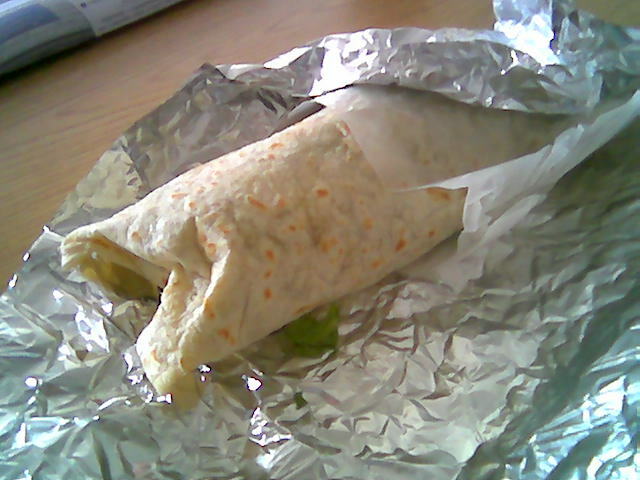 This is the wrap, unwrapped. Something that is classic New World Tortilla (or New World for short) is the toasted wrap, and the little wax bag to hold the bottom of the wrap. The Wrap after a few bites. The toasted wrap means that it’s easier to bite into and you’re assured that you won’t get that gummy texture that sometimes comes from a cold warp. 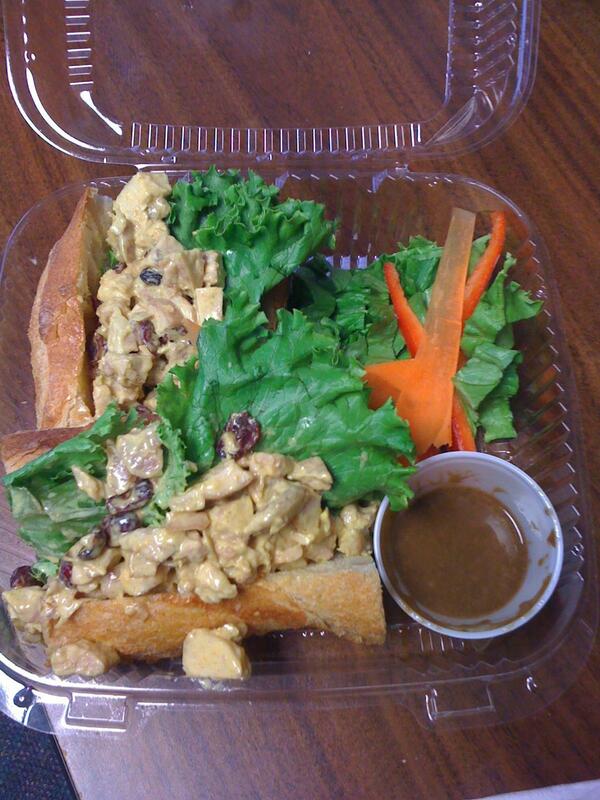 The chicken salad contains grilled chicken breast that is chopped and combined with fresh dill, halved red grapes, mayo and typically shredded romaine lettuce. 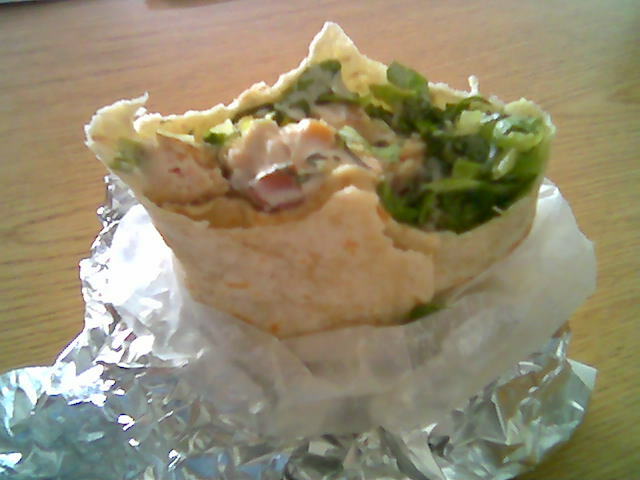 This wrap has great texture, and great flavor. I like the fresh dill and sweet grape combination. The fact that the wrap is made with chicken breast means that it has different texture, than if the rest of the chicken were used. 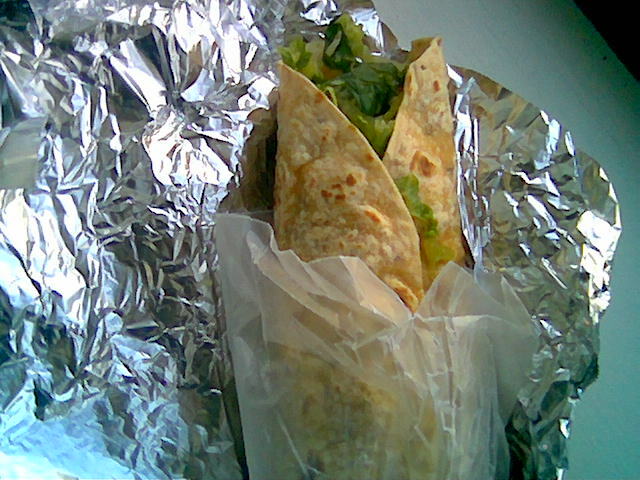 At one point this wrap was served with mesclun greens, which while they don’t have the same satisfying crunch of romaine, the slight bitterness of the greens was a nice counterpoint to the sweetness of the grapes. I may request a romaine / mesclun mix next time if possible. Pictured above is a little fun with the recyclable foil, standing the wrap up while I get something to drink. At under six dollars this wrap is a steal, but only on Thursdays!